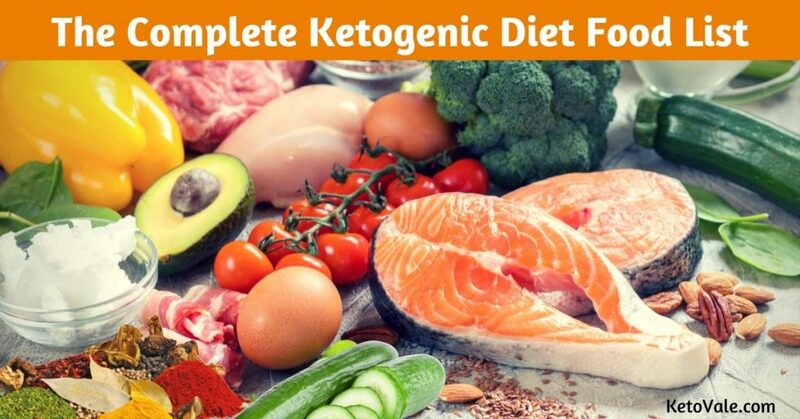 The ketogenic diet is one of the best diets on the planet for fighting disease and losing weight (1). Although the word “diet” can seem intimidating to some, you should think of the keto diet as more of a lifestyle change, a way of eating that includes meal plans you can enjoy for the rest of your life. The keto diet was designed to mimic the health benefits of intermittent fasting by limiting the glucose available to your body. It works by putting you into a state of ketosis: instead of using glucose from carbohydrates as energy, your body uses fat. This means that it becomes easier to burn your body fat, together with the fat that you’re ingesting. Limiting the available glucose also stabilizes blood sugar levels and reduces the risk of many diseases. 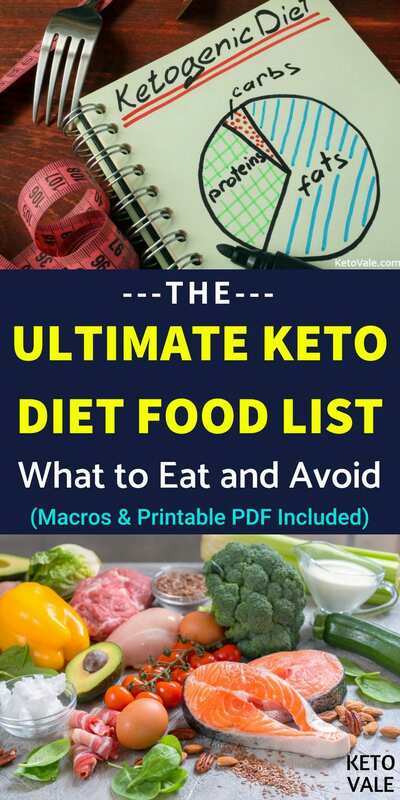 Below you will find a list of what you can and cannot eat on a keto diet. We will also provide the average nutritional information of each food and explain everything in details. The list is our recommendation of the most keto-friendly foods for optimal results, based on science. We have taken into account the health benefits of the different foods and their macro- and micronutrient profiles, as well as scientific evidence, in order to present you with a comprehensive and easy-to-use list of foods. Of course, everyone is different and you might find out that you respond better or worse to some of them. The best way to find out your ideal foods is to experiment. Additionally, the quality of the foods you choose to eat, combined with a good understanding how your body responds to different types of food, will make a huge difference. Ketogenic way of eating isn’t a one size fits all diet. It's best to personalize your diet to fit your individual circumstance and health condition (E.g. insulin resistance, lactose intolerance, allergies, etc...) to meet your needs and achieve your goals. The foods listed here work well for many people. If you follow a very strict keto diet, make sure to personalize this food list to make it work best for you. ​If you are looking for a ​Done-For-You ​Meal Plan​, check our Free Keto Meal Plans! These are complimentary plans that can help you get started! For your convenience and to save you time, we also created this infographic to summarize what you can eat on keto. Feel free to save this infographic photo by pinning it to your Pinterest board for later use. ​​You can also download this printable PDF food list for later use: Click here to download it! A big part of your calories on the keto diet will come from fats. These can be the natural fats present in different foods, for example in meats, avocado, eggs, nuts, as well as fats extracted from different sources, such as coconut oil, olive oil, avocado oil, butter, ghee, lard, and so on. Contrary to popular belief, sugar (and not fat) is often the driving force behind weight gain and disease. There’s a catch, though: not all fats are created equal. 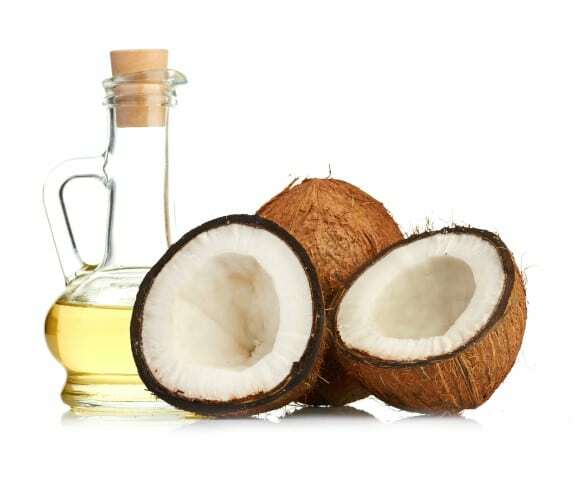 Saturated fats: these include coconut oil, lard, ghee, and butter. 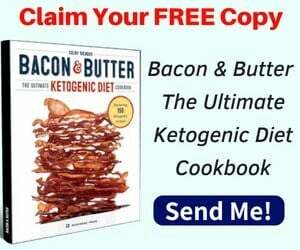 A part of your fat calories on the keto diet will come from saturated fat. Monounsaturated fats (also known as MUFAs): also known as “good” fats, because they can have a positive effect on your heart health and cholesterol levels. Oils that are high in MUFAs are, for example, olive oil and avocado oil, and can be consumed on a keto diet. Polyunsaturated fats (also known as PUFAs): these fats can also be beneficial for y​​​​​our health when eaten in moderation, depending on the source. Naturally occurring polyunsaturated fats, such as those found in animal fats and fish, are much better than processed oils, such as corn oil, rapeseed oil, soy oil and margarine. This is mostly related to the ratio of Omega-3 to Omega-6 fatty acids that you can find in most processed oils that have a high PUFAs content. Trans fats: these fats are best avoided completely, as they have a negative impact on cholesterol and heart health. Trans fats are chemically altered to improve the shelf life of products that contain them. A good rule of thumb is to avoid any product that contains the word “hydrogenated” in its ingredients list. Keep in mind that fats are very calorie-dense, so even if you’re eating “good” fats, you can gain weight simply by consuming too many calories. Fat is very satiating and the ketogenic diet makes you feel less hungry overall, so you’ll probably be naturally eating less than before. However, it’s still a very good idea to track macros (and therefore also calories), especially if your goal is fat loss. Fat consumption should depend on your goals and current body composition. If you have a lot of fat to lose, let your body burn it off by controlling the amount of fat that you’re consuming. If you’d like to maintain your weight, you can use fat to increase your calorie consumption to maintenance levels. Remember: fat is a lever. Besides these common sources of fat, you can also use MCT Oil and Powder as a healthy source of fat in your diet. MCTs stand for medium-chain triglycerides, which is a form of saturated fatty acid that has many amazing health benefits. MCT is a special type of fat that can ​trigger and help you get into ketosis fast. * If your goal is weight loss, you might find it beneficial to limit dairy and nuts for a while, and to always properly measure and track them, if you have them in your diet. The oils you’re buying should be virgin and cold-pressed whenever possible, meaning they have not been heated to high temperatures and stripped of their nutrients. When choosing nut butter, make sure they don’t include added sugars. It’s a good idea to buy organic, grass-fed and antibiotic-free meat, and wild fish, whenever possible, however, we know that the price can be prohibitive at times, so ultimately, buy what your budget allows for. When it comes to choosing full fat coconut milk, make sure it's gluten-free and contains no preservatives. This product usually comes in a can and ideally, you only want to have coconut extract and water as the ingredients. Some brands might add guar gum to thicken the liquid. Some people refer it as coconut cream. Depending on the brands and the ratio between the liquid expressed from grated coconut meat and water, the fat content might vary anywhere from 15g-22g of fat per 100g serving. Save this ​fats list to your Pinterest board for later use! 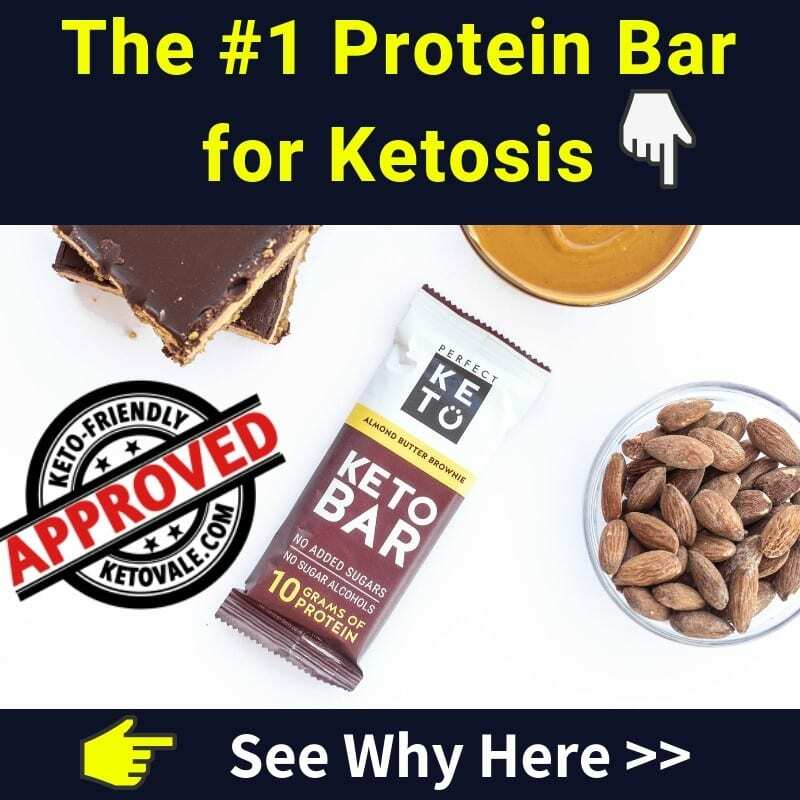 Protein, together with fat, is essential when following a keto diet. Many fat sources are also high in protein (such as fatty meats and nuts), so these two often go hand-in-hand. 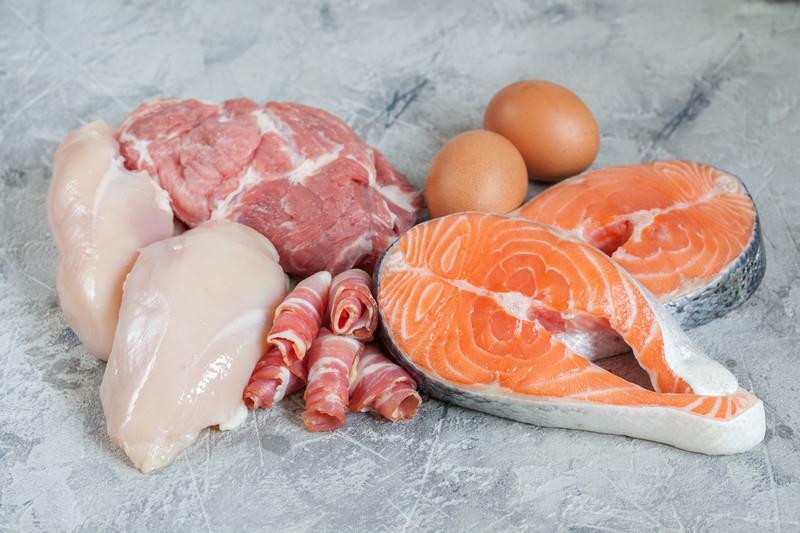 It’s best to choose organic meat, fish and eggs whenever possible, as their quality and nutritional profile are often better, together with taste, however, if you don’t have the money for it, just choose the best quality that fits your budget. While dairy can be consumed on a keto diet, you should keep in mind that some products (such as milk and yoghurt) can be quite high in carbs, while others, such as cheese and heavy cream, are quite caloric. Additionally, some people are sensitive to dairy, so if you have hit a weight loss plateau, you might want to limit dairy for 2-3 weeks and see if that helps. Beef: steak, brisket, ground beef, roasts, veal, and stews. Pork: tenderloin, pork loin, pork chops, ground pork, and ​pork belly. Poultry: chicken (breast, thighs, wings, drumsticks, ground meat, etc...), quail, duck and other wild game. Organ meat: heart, tongue, kidney, liver and offal. Other ​meat:​ veal, goat, lamb, turkey and other wild game. Whole eggs​: can be poached, fried, deviled, scrambled, omelette and hard boiled. Fish: salmon, barramundi, snapper, tuna, catfish, cod, mackerel, flounder, trout, whiting and perch. Shellfish: clams, lobster, crawfish, oysters, crab, prawns, shrimp, mussels, scallops, calamari and squid. Processed meat: bacon, ham, sausage, and salami. Check labels to make sure there are no nasty extra fillers or added sugar. As your fat intake will depend on your daily macros and goals, you might sometimes want to choose fatty cuts of meat over leaner ones, or the other way around. Seafood is also a great option for lean protein. You should prioritize whole, unprocessed foods. Deli meats, salami, sausages and other similar products can be very convenient at times, especially if you are travelling, but will feel less satisfying, and sometimes contain additives that you might wish to avoid. Use them in moderation and always check the label. Whenever you’re at a restaurant or at a dinner party, you should watch out for hidden sugars in sauces and marinades. If you’re unsure of the contents of a given sauce, it’s best to not eat it (you can always ask to have it on the side). Protein powders including ​collagen peptides can be a very convenient way to reach your protein macro for the day but will not keep you full in the same way as whole foods. Remember to always check the specific macros per serving, as some protein powders can be quite high in carbs. If you want to be sure, read our reviews here. The best vegetables to eat on a keto diet are the ones that are low in carbohydrates and calories. These include green, leafy vegetables such as spinach, as well as cruciferous vegetables such as kale, broccoli, and cauliflower. Avoid consuming starchy vegetables, such as potatoes. When it comes to choosing vegetables, opt for ones that are organic as they are higher in some nutrients than conventional. Frozen and canned vegetables are fine as long as they contain no added sugars. 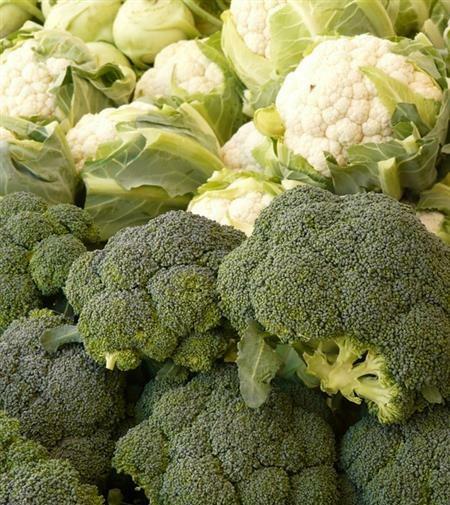 Choose your vegetables based on carbohydrate count and make sure your portions are small. Generally, a well-formulated keto plan will give you enough fiber. If you concern about not getting enough fiber, you can try these ​fiber supplements. Below you can find a list of low-carb vegetables that are excellent choices when doing keto. Save this vegetables list to your Pinterest board for later use! Although fruits have a number of health benefits, it also contains large amounts of sugar and, sometimes, a lot of calories, too. It is therefore, best to limit fruit as much as possible on a keto diet. Avocado is the only exception. Besides the high amount of healthy fat, avocado has many health benefits and contains few net carbs. If you miss fruit too much, you can still enjoy some in moderation, especially berries. 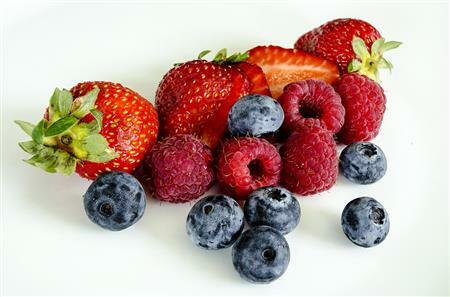 Make sure that you’re choosing options that are lower in carbohydrates and contain a high amount of antioxidants, such as blueberries, blackberries, raspberries, and strawberries. You also need to keep an eye on servings’ size, as carbs in fruit can quickly add up. Fruit juices are off-limits on a keto diet as they are usually highly processed and contain refined sugar. If you are going to eat fruit, it’s better to eat the whole fruit to get the fiber that comes along with it to fill you up, stabilize blood sugar levels and aid in digestion. Avoid fruits that are high in carbohydrates such as bananas, apples, and pears. Dried fruit should also be avoided as it usually contains preservatives to extend its shelf life, and too much sugar. ​*Most fruits outside of berries are not keto-friendly because of the high sugar content. Fruit juice, dried fruits & canned fruits usually have added sugar which ​are NOT keto friendly. 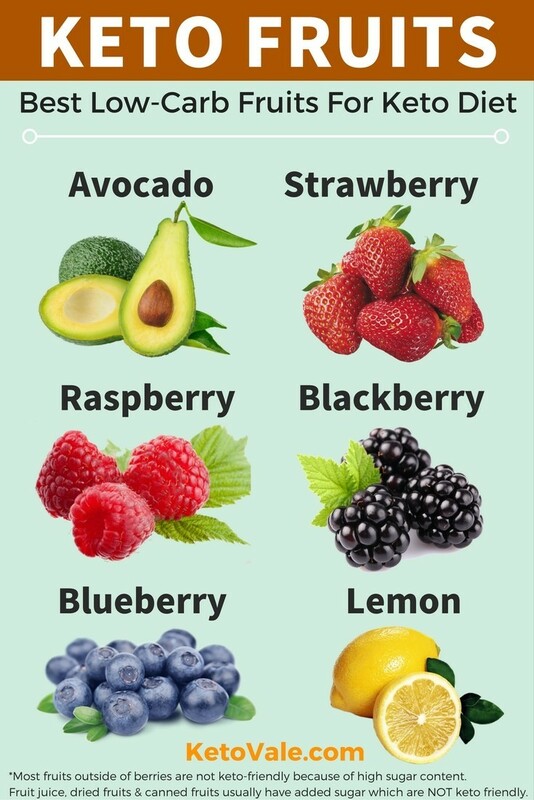 Save this ​keto fruits list to your Pinterest board for later use! One of the definite advantages of the keto diet is that most people feel less hungry, which means it is easier to follow it than other diets. That’s why you might not feel the need to snack at all, and you should be able to limit it without too much trouble. Mindless snacking is definitely something you would want to avoid, but if you feel genuinely hungry and if having a snack will help you stick to your daily macros, there is no reason not to have a few nuts, for example. Remember to always measure and track snacks. Before having a snack, try having some tea or water (with or without lemon, and with or without salt) to make sure you’re not just dehydrated instead of hungry. If you must snack, stick to foods that will keep you full for longer periods of time and that will curb feelings of hunger. Also be sure to keep your portions as small as possible. Condiments are a great place for hidden sugars to lurk, so be careful of any condiment that you didn’t prepare yourself. Spices can be used to enhance the meat’s taste, but keep in mind that they have carbohydrates in them, so you’ll need to add this to your count for the day. 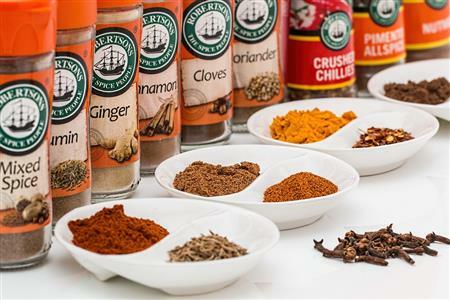 If you’re using spice blends, look for the ones with no added sugar. Mustard is a good option, given that you find a good one that includes just mustard seeds, sea salt, and vinegar. Coconut milk (full fat) and coconut cream can be use in many recipes, especially as a thickening sauce in meat dishes such as curry, creamy soups, or in dessert​ recipes. It's a good replacement for heavy cream if you want a dairy-free option. Coconut milk (light version, less fat) is a good choice for soups and drinks such as milkshakes and smoothies. Make sure there's no added sugar in the products you choose. When it comes to vinegar, ​​the very low carb choices are white vinegar, cider vinegar and wine vinegar (less than 0.1g carb per t​ablespoon). Balsamic vinegar ​has a much higher carb content (2.7 g carb per ​tbsp) so you really need to be careful with the amount you use. It's best to stick to lower carb vinegar options. It can be tricky to know what to drink on the keto diet. If you’re ever unsure, water is always your best bet. If you want to step up your game, try lemon water. 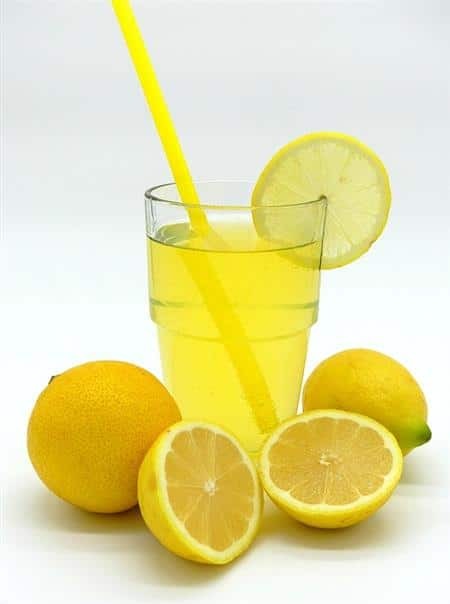 Lemon water alkalizes the acids that are found in most keto foods to keep your blood pH levels neutral. Unsweetened almond milk teas, and coffee are perfectly acceptable on the keto diet. Other unsweetened nut milk can also be good options, but make sure to always check the label for the exact macros, as they can differ a lot. Some evidence suggests that too much caffeine may have contradictory effects on blood sugar levels, so be sure not to drink more than one or two cups a day. When you consume alcohol, your body will burn the alcohol first, then carbs, and finally fat. So, it’s best to avoid it. If you’re attending a social occasion where alcohol will be served, opt for a dry glass of red wine and limit your intake to one or two. For more information on keto and alcohol, as well as a detailed macro guide for the different types of alcohol, check out our article, The Ultimate Alcohol Guide on Low Carb Ketogenic Diet. The idea behind a keto diet is to keep your net carbohydrates below 20 to 25 grams daily. Indulging in fruits and vegetables that are a bit higher in carbohydrates is possible, however, bear in mind that you’ll have to fit them in your daily macros and adjust your remaining carbs for the day. To keep it simple, just remember that the sweeter the vegetables are, the more sugar content they have. Root vegetables (such as turnip, ginger, parsnip, turmeric, etc...), bulb vegetables (such as garlic, shallot, onion, scallions and leek) and most vegetables that grow underground such as carrots usually have a higher carbohydrate content so you need to be very careful with the amount you eat. While most beans and peas are not recommended on keto, green beans are fine in moderation. Other types of squash you consume except zucchini have much higher carb counts so you need to be careful. Baking a gluten-free dessert with flaxseed meal, almond flour, coconut flour and raw cacao powder is occasionally allowed, but you should keep an eye on calories. The low-carb substitute for breadcrumbs can be almond meal/flour, coconut flour, flaxseed flour, Parmesan cheese and ground pork rind (pork dust). Despite being generally keto-friendly, nuts are very calorically dense and some nuts are also high in carbohydrates. This means that you’ll need to track and monitor your serving sizes carefully. Peanut is technically a legume that grows underground, as opposed to tree nuts such as macadamia and almond. There is a debate whether peanut and peanut butter should be on keto or not. It's your personal choice. A small serving size might be okay for many people but avoid overindulging because they are tasty and nutritionally dense. As far as dairy is concerned, keep in mind that milk and most store-bought yogurts are not optimal. Additionally, dairy products can be hard to digest for some people. Replace regular yogurt with Greek yogurt. In place of traditional fermented Kefir, you can try coconut kefir for gut health and regularity. ​Half-n-half or ​light cream ​might be acceptable ​when using in moderation or when you eat out and have no other choices. However, you should always try to choose heavy cream instead. You can dilute heavy cream in water if you need different texture or consistency for your recipe. When it comes to pre-shredded cheese, it's ​best to buy​ a big block of cheese and shred it yourself. The problem with pre-shredded cheese is that some brands might put ​flour or cornstarch in​side to keep the cheese from sticking together. ​Cheese in general such as mozzarella cheese or cream cheese still have carbs so when consuming it, make sure to check the portion size because the carbs can add up very quickly. Deli meats might be low in carbohydrates, but they are not optional, due to the many additives. You can eat them occasionally, for example when you’re in a hurry or when travelling, but do not include them in the foods that you are consuming daily. All grains and gluten-containing foods should be avoided on a keto diet. Be mindful that gluten lurks in many foods, so always read food labels to be sure. Beans, corn, rice, legumes and other starchy foods also need to be completely avoided. Many gluten-free kinds of pasta still contain corn or rice, so avoid them altogether. In place of regular pasta, try zucchini or squash noodles. It’s also a good idea to completely avoid soy products. Some people might still use soy sauce. However, coconut aminos are a good alternative to soy sauce for keto. Regarding sauces, many of them contain added carbohydrates and hidden sugar, so be careful when using them in a recipe. You can make your own homemade sauces such as mayonnaise and ketchup. As a general rule, you should avoid sauces at restaurants as they are often full of sugar, gluten or soy. You can always ask the waiter for information on the sauce’s contents and also order it on the side, in order to control serving sizes. Most fruits such as banana, apple, papaya, dragon fruit, durian, water melon, orange, pineapple, grapes, mango, tangerine, mandarin, grapefruit, cherry, etc... ​because they are high in carbs and sugar content. Fruit juices, fruit smoothies, dried fruits, and fruit syrups. Beans and ​legumes such as chickpeas, black-eyed peas, green peas, kidney beans, mung beans, black beans, pinto beans, white beans, navy beans, great northern beans, fava beans, cannellini beans, lima beans, and lentils. Starchy ​vegetables such as corn, potato, yam, sweet potato, cassava, parsnip, yucca. Grains such as wheat, bulgur, barley, amaranth, rye, oats, tapioca, millet, rice, quinoa, sorghum, sprouted grains, buckwheat. Starchy foods such as flour, pasta, noodles, bread, crackers, cookies and pizza crusts that are made from any of the grains or starchy veggies above. Hydrogenated and partially hydrogenated oils and processed vegetable oils such as cottonseed oil, corn oil, peanut oil, sunflower oil, safflower oil, grape seed oil, rapeseed oil, rice bran oil, soybean oil, and canola oils due to their high Omega-6 content. As far as artificial sweeteners are concerned, these can be used occasionally, but you should know that some of them will raise insulin levels and are sub-optimal for that reason. They might also cause weight loss stall for some people. ​The keto diet is full of naturally healthy and satiating foods, which means you shouldn’t feel the urge to snack or eat above your caloric requirements. In order to optimize weight loss, you will need to track macros and to be in a caloric deficit. There are plenty of apps and websites that allow you to do this. In order to stay in ketosis, you need to to stay at or below 20-25 net carbs per day, which still allows you to eat plenty of green vegetables (which are essential for their micronutrients). Stay away from processed food as much as possible and eat whole food that you prepare yourself, so that you can track its macros. Keep things simple and stick to the basics: meat, veggies and salads, avocados, eggs, and some nuts from time to time. If you need ideas on what to eat, we have plenty of recipes for excellent keto meals, so make sure to check out our Recipes section. *Disclaimer: We try to provide the most accurate nutrition facts of all the foods presented on this page. However, the actual nutritional information of each food might vary based on the ingredients it's made of, the brands and other factors. Make sure you read the food labels, check the nutritional information and track your macros for the best results when following keto diet. Save this list to your Pinterest board for later use!